It followed the book for the most part....I usually like Lithgow's acting but the overall acting of the cast - not that great. It had a few scary moments but was the ending meant to be scary because I found it to be rather funny?! The best acting in this movie was by the cat. If you want a thrill, see the original instead, it was actually based on the book by Stephen King; I have no idea what this movie was based on. The actors had no chemistry, their acting was lame and the movie was nothing like the book. Huge Stephen King fan, huge horror movie fan, I really wanted to like this movie. It was however, a poor substitute for the original Pet Sematary movie which was soo much better, and actually followed the book. This movie was just plain silly, the best part was the ending, at least I got a laugh out of it. See the original, it was much, much better; Stephen king obviously had no say in this movie. What a disappointment. Lame remake of a lame movie adaptation of a mediocre book. Skip it. The original movie is better there not very much character and/or chemistry development between Louis creed and Jud Crandall, in the book Jud was like a father to Louis and in this 2019 movie it is like they are not even friends. I was looking forward to this movie and it is a HUGE disappointment and a waste of Time and Money, in my opinion. Very Disappointing!! Rather ho-hum. A couple of tense moments, but not scary in the least. Original movie was scary. This one fell a bit flat for me. Great! Great! Great! Best horror movie I've seen since The Shining!!! Extremely disappointing, over-hyped, and very boring. Lithgow added nothing to this story. And the wife’s flashbacks took away from the current story. Boring. Boring. Boring. We enjoyed this movie! Don’t understand the negative reviews! This movie was really bad! Nothing like the book or original movie. Just awful! I love anything Steven King but not this one. Did Mr. King see this before it was released???? The movies is a waste of time not worth the money., was boring, and not scary at all. I fell asleep before the girl got hit by the truck. Had lot of flashbacks, you knew what was going to happen no suspense. Decent thriller. About the ALL CAPS poster, hope they're keeping you comfortable in your ward. Don't do all caps though, the ward super might notice you and up your meds.... good luck! Not scary. It did not follow King's story it added a side story with wife's sister that did not make sense or add anything ar all. Good actors gone to waste. Great horror film . I was glad the story was a bit different from the first Pet Sematary movie. Both great horror flicks. Unfortunately this version fell flat, the trailer is the movie, nothing really extra to get excited about. Missed opportunities to use the children (shown in the trailer) or flashbacks to other humans who have returned from the dead. Things like that would have added to the storyline. Disappointing. Loved this movie! Was lucky enough to see the premiere at the SXSW festival. The actors were incredible and it is full of twists which keeps you on the edge of your seat. 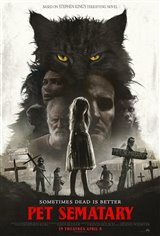 HELLO GOOD MORNING MOVIE FANS THIS MOVIE STEPHEN KINGS PET SEMATARY MOVIE IS GOOD AND SCARY AND I LOVE IT AT ALL. AND .PLEASE SEND A NOTE FOR ME PLEASE WHAT DO YOUTHINK ABOUT THIS MOVIE . AND THANKYOU. AND I JUST 5 STARS AT ALL.